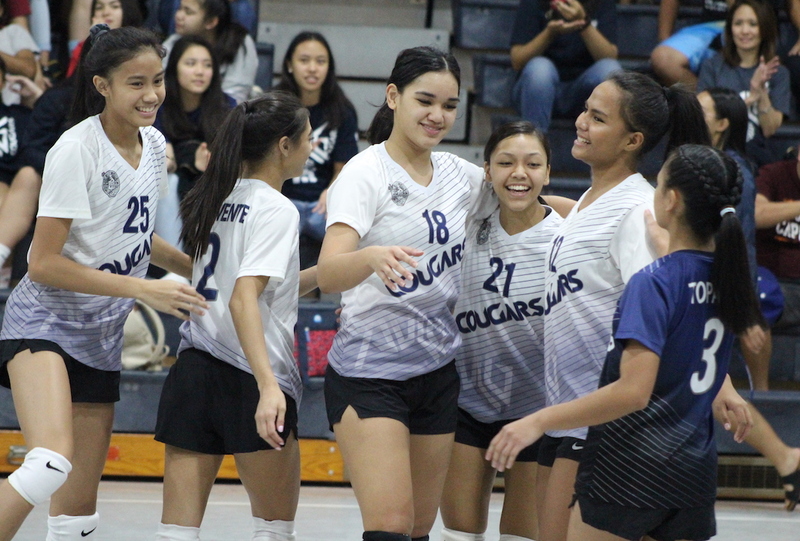 The 2018 girls volleyball semifinals will feature four very familiar teams next Tuesday as the ND Royals, St. John’s Knights, Academy Cougars and GW Geckos all advanced after picking up wins in the first round of the playoffs Friday evening. Action in Hagatna got off to a strong start for the Academy Cougars, but an even stronger finish helped propel Academy as they defeated the visiting Tiyan Titans 25-15, 27-25, 25-17. The ND Royals were too much for the visiting JFK Islanders as the still unbeaten Royals sent the Islanders packing 25-14, 25-17, 25-20. St. John’s faced little resistance in their game against the Harvest Eagles, grabbing an dominant 25-13, 25-13, 25-12 win. Losing to the Tiyan Titans in the regular season was a real eye-opener for the Cougars in their pursuit to prove their worth as one of the leagues best teams. Despite being the Cougars being the higher seed, hosting the Titans weren’t going to get anything less than Academy’s best Friday evening. “We learned to never underestimate our opponent. We got a little too comfortable after winning the 1st set against them in the regular season, but tonight we were ready to play,” said Taimanglo. The hitters came to play for the Cougars as Taimanglo, Isabella Bargrede and middle Laressa Halladay wrecked havoc against the Titan front line. Leading 20-17 in the 3rd set, Taimanglo took it upon herself to close out the Tiyan season with the Cougars final five points coming off her fingertips. Theisen started off her game-clinching run with a two hand block up the middle on Titan Aija Fegurger. Taimanglo followed up with an even bigger block that had riled up her teammates. Off a clean set from Cassidy Tobiason, Taimanglo smashed a strong kill off the block to go up 23-17. One more kill from Theisen followed by a block on the final point was enough to send her on-court teammates into a frenzy. The Cougars will travel to face the St. John’s Knights next Tuesday at 6 pm in the semifinals, their first meeting since Academy handed the Knights their first loss of the season. The St. Paul Warriors had the GW Geckos’ number in the regular season, but GW refused to make another early playoff exit like they did in 2017 as they toppled the Taga Division’s 2nd best team. The Warriors seemed had rallied behind coach Nate Pineda, who took over as head coach in the middle of the season. Since the change, St. Paul racked up wins against the likes of the Geckos, Academy Cougars and even a closely contested game against the ND Royals. The Gecko game plan was in effect as they narrowly escaped the 1st and 3rd set, which could have gone either way. GW seized momentum in the 4th as they shut the lights out in the Warriors building with outside hitter Mikayla Castro coming up big in the clutch. GW will travel down South where they started the season, facing off against the ND Royals for a trip to the title game.